we had a great feast on Ovive - we all made a part of the dinnner and it was fabulous. Then we watched the fireworks that went off from the top of the Skytower! too cool Enjoy yours! 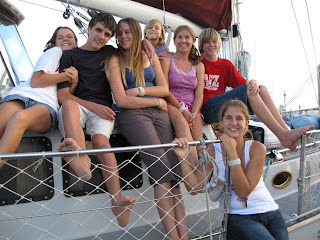 this is the last photo of all the kids on our boat, we all part after the road trip! It will be sad! 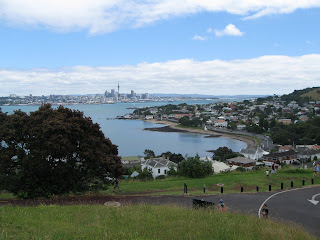 Notice the title , cause that is the suburd of Auckland where the marina is ,Auckland is huge! New Years day was a blast!!! 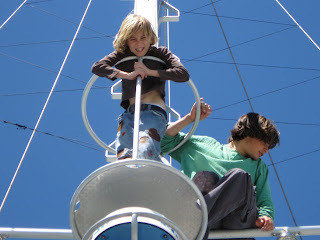 The kids have met more boat kids - twins ( boy and girl) Daniel and Anderson (15) and their brother Josh ( 16). they have been cruising for over 3yrs , came from England and have now moved on land here by our marina. Nice kids!! They really enjoyed being in the crowsnest. They all went over to their house for a swim in the ocean ! will hang out again once they are back new years day afternoon. 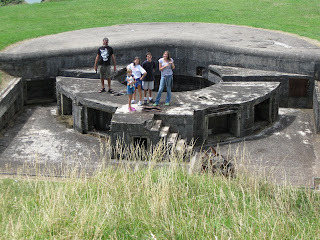 After the swim we went and checked out the navy bunkers at the Natonal Reserve Park just in Devonport. very cool!! and a fantastic view. we spent a couple of hours there going through all the tunnels and checking out the canon areas. This is actually an old volcanoe! very neat. 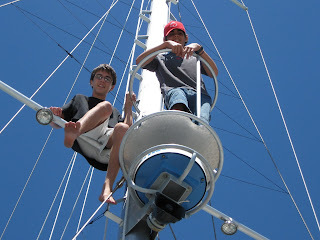 Kyle and Daniel up in crows nest! Emma has really been enjoying taking pictures with my old camera! She has decided to make a calander! watch out she will want you all to buy one! Emma with Josh in the crows nest. its was a very hot day, they left right after this picture to swim! Hey you all , thought you'd enjoy the santa!! Me and him have somethng in common! Gee wonder who has done that before? could this be another trivia question?! here are a few pictures of Christmas and Boxing day. Also it is count down time for the 3 boats Orca III, Malachi, and O'Vive - we part in 3 days. We will be travelling together to Rotorua, the two boats have rented a house for 4 days so we will stay with them for 2 nights and see Rotorua. Then parting time. Ovive will keep heading south, Malachi will come back after we have left the dock , not sure where we are going yet. but the Coromadell is in our mind. Joan ( New Paige) and I at their boat for boxing day!! Auckland Bridge by sunset, this is our view from the boat! Steve got me a new digital camera, so you will have to wait for the Christmas phontos. still learning how to use it and need to load the disk into the computer. 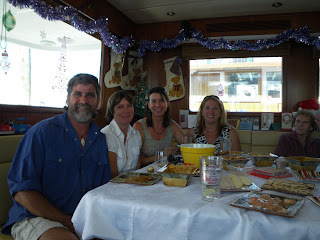 Today is Boxing Day here and we are off to New paige's boat for a party. We did dinner on O'Vive, I cooked the turkey and made the best gravy ever! Mom, you would be impressed , nice and dark and everything, learned from a good teacher!! we were all stuffed! so much left overs that we are having lunch together today........ Merry Christmas to you all, sure miss the snow, thanks for the great pictures of the Marina and the Garage Ruth!! We wish you all a very Merry Christmas!! Here is a song I wrote , enjoy and the trivia question is guess what christmas song's tune I used for my song.......... loving you all !! It’s Christmas in New Zealand with all of the cruisers here! The glowworm caves are open…… the cruiser pay a call , and friends we meet will come and see the boating life and all! The boiling mud, the 90 mile beach, the places we have yet to see! 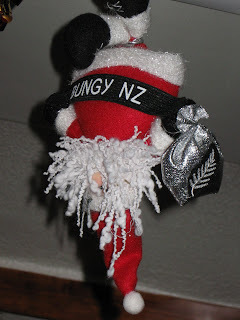 Its Christmas in New Zealand for the crew of Orca III!!!!! We have had quite the busy week! Besides the shopping rush, making presents and baking galore! On Sunday we went to the church Malachi has been going to. It was a party! first there was a jumping castle thing - the older kids had a blast in it! Then Kyle , Maya and Emma tried this bungy thing. you have to run on the air filled comtraption with a bungy cord around you and try to stretch as far as you can and place a bean bag on the velcro. As soon as you release the tension the bungy springs you back .. boy that was funny to watch! Then we went into the church to " sing " christmas carols...... the whole point of coming, boy were we suprised to see on the "stage" a full drum kit , 3 electric keyboards, one bass guitar, a lead guitar and an acoustic guitar - smoke show!! purple lights , an awes0me choir and we " rocked" to the carols! It was like being at a concert!! way cool, I felt like dancing the whole time! we had a blast.. then they threw streamers and dropped balloons on us all. Also handed out candy canes. I turned to Marg and said " this is NOT church!!!" we loved it .. great way to bring in the christmas cheer. Steve was whistling and everything. check out Malachi's blog for the photos! Dionne loving the New Zealand " Beer" - Mel brought Steve a beer and he took a sip- then came to me and said to try it...... I did and boy did I like it!! turns out he grabbed a this instead - they look just like beer , We are getting this stuff I tell ya!! This is Mel and his family..........nice people , nice house and she even grows sweet peas!! Mel and Steve having a " Ball"
We went to the hot springs here in Te Aroha - its all naturally heated and full of great minerals! Maya is standing by the geyser - its the only soda water one in the world! Here it is , wow,eh! It didn't get much bigger, we figure its pretty well tapped for the mieral baths and pool. 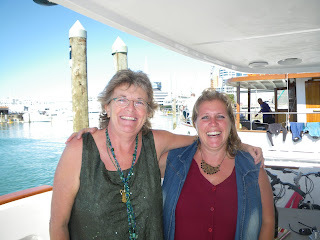 On Tuesday we left with O'Vive and met up with Dorothy Marie at the Kauri Museum. We drove 2 hrs north this time.... the museum was great!! loads of the Kauri Gum ( same as our amber just from the Kauri tree, its the sap from the tree.) this stuff is beautiful. The museum has kauri gum coal dated 43 million yrs old.! These 2 lighthouses made from kauri gum made me think of you Heather!! The museum was huge and full of life from the past. The loggers, gum diggers, servyors ect. equipment and machinery ( Steve of course loved this) the kauri tree is NZ's largest native tree. It is a type of conifer and grows in the northern part of the North Island. The kauri hardwood forests are among the most ancient on the world. The larges kauri in existeence is Tane Mahuta ( Maori for LOrd of the Forest) it is 4.4 meters in diameter and 17.7 meters to the first branch. It is in the Waipoua forest and we will go there once we are back in Opua area. The museum has displays of even larger treees that were growing in the past! the oldest tree in the forest is estimated to be 2000 yrs old! I can't wait to see that one! We had a fantastic few days , very busy!! Here Steve standing next to a steam engine , he had a good time explaining how it worked to all! This is a butter churn made from the Kauri tree. oh my god it'd huge! looking out the window - in the background is a volcanoe, called Rangitoto - its the youngest and largest. It eruptedout of the sea 600 years ago. We went into the city do drop off Steve's info for a work visa - and we toured around. Auckland is very much like Vancouver - except the Sky Tower is way taller than the Harbour Center. We went up as high as we could go and had a great look around the city. can see so far! there are glass floors to look way down and the elevator also has a glass floor. Emma was on her hands and knees looking down! They also have people doing jumps from the tower.. kinda like parachuting without the parachute - they are on wires and lines. quite the thing to watch. You can also do the sky walk , which is being harnessed on and walking around the outside, not for us thanks! but Natalie on O'Vive is thinking about it. They have a very good movie in the gift shop about Auckland from the beginning to now. Very well done and informative! Auckland is the only city in the world built on an active field of volcanoes. Sky Tower is taller than the Effel Tower and is the tallest tower in the southern hemisphere. makes you just wannna run out and go up , eh Mom!! It took 33 months to build it! We were so very tired at the end of our city day............... been there done that, on with the next. We have been doing the christmas thing - even got a real tree and decorated it . you'll have to wait to see the picture. working on getting the anchor winch fixed and just waiting for our heat exchanger part. 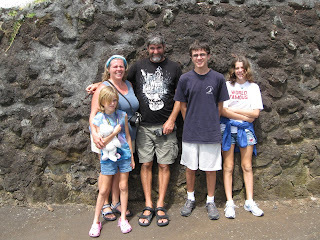 We are planning on doing some more touring - hoping to get to the Kauri Museum before Christmas. One of Steve's friends in in town ( Mel for those who know him) and will meet up in the next few days. have talked on the phone already. He's in Te Aroha and so we will drive out there and see him. By the way Kyle is 5'7" almost 5'8" - he's getting so tall, and Maya is taller than me! only Emma is shorter , but not for long!!! Way to go mom, yes you are right and first ( only also I think , guess I stumped everyone else! good for me) Wellington is the Capital and your 3 birds are right... there are more of course , but I'll let you all look them up yourself. I was even impressed that my mom didn't include the wecka that I had mentioned she got 3 different ones. We are all settled in the marina now, Steve has been scrubbing the deck and boy does it look fantastic! He even managed to get all the rust flakes stains off the bow deck and I love it. The boat is looking so good! Even managed to get the kids to polish the brass keroscene lamp ! that was a hard one as it hasn't been done for so long , but Maya got it looking beautiful! We are getting all decorated for Christmas.. found LED lights that run on 2 AA batteries, and they were on buy 2 of 1/2 price and get a third FREE! my kinda deal!! We have a car to use , thanks to Neall M"s brother and we have been loving the freedom to get around . we will be going on day sights this week. ( remember him, he was the first govenor of New Zealand. He also introduced a bunch of animals, (including the peacock they are not native here) zeabras and monkeys that didn't surrive the New Zealand weather and also wallabys, to which they are still around and are a problem. they mulitiply like rabbits!! They are only on Kawau Island. Just found these and wanted to show you some faces to the friends we have here! 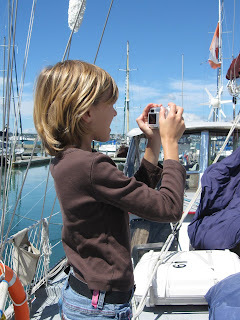 We are in Bayswater Marina in Auckland, will do an updated posting for you all later. Teresa and Danny Lou way to google! You are correct it was Sir George Grey and he was New Zealands first Govenor . Enjoy our friends! Glenn ( Tin Soldier) and Steve having a great time! Nancy ( Meridian) Dionne, and Marilyn ( tin Soldier) have a girlie good time! Marilyn , Glenn & Sally ( Dorothy Marie) and Me - this was the American Thanksgiving night at the Cruising Club! fun fun fun and tons of food!! we have changed our plans and are heading straight to Auckland. Expect to be there Dec 12-13 depending on wind and how much faster we can run the engine before it overheats. We left yesterday ( tues NZ time) to head to Great Barrier Island, sloppy seas and not a lot of wind and then the heat sensors alarms going off, made for a decision to change heading to Auckland asap. The trany starts to overheat if we motor more than 1000 RPM. ( this means with no wind or wind in our face we are "LIMPING" ever so slow. We pulled into Urquart bay at the base of the river going up to Whangerai so Steve can do some more adjustments and make it so the trany won't over heat. We will be leaving today , most likely stopping around Kawau Island for the night and then into Auckland. ( this is the current plan, depending on how the engine and trany respond and of course the wind.) We will check out Great Barrier Island later on after we get the heat exchanger dealt with. Also forgot to mention, Monday night we anchored out in Tutukaka - the wind we knew was to come up to about 20 knots gusting to maybe 30 - no biggy... after we went to bed ( of course, dark, pouring with rain and cold out) we heard a bang so loud we thought the boat in front of us dragged and hit us.. turns out it was the anchor and chain tugging so hard it broke the clutch ( lock dog) and the chain started to roll out. Steve jimmied something for the night. the solid aluminum handle broke right in half and the corner of the windless is also damaged . another thing to get welded and fixed in Auckland. I off course didn't sleep hardly at all that night, Steve slept like a baby. We didn't drag and nothing else happened , made for a long night for me. But like I said our ACE MECHANIC did a good job and we are doing great!! We will leave here tomorrow for Auckland. Life is good !! HO HO HO HO! We have found Santa and his helpers! Trivia #2 Mansion House (New Zealand) Who lived here in 1860 and what was his role in New Zealand? good luck to you googlers! Steve has been working away , touching up the rust stops , boy the boat looks good! It's amazing how offshore sailing takes a beating on the boat! But she is pretty again! !, just need to do the deck and bottom. Unfortunately, we can't get the deck paint here so will have to wait until we get home. 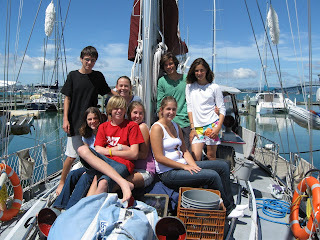 We will be leaving the dock to anchor for the night and then head to Great Barrier Island . Its supposed to be beautiful !! have had 3 cruising boat there already aand they can't say enough about the place . Just wait and see. We went to a festival the other day and Kyle and Maya played with all the cool circus stuff - This was a father and daughter juggling act! The girl was excellent!! Trivia question # 1 (again since its been so long!) What is Steve making? Big Prize for answer..creativity counts too!